Their first meeting in 1981, one of the biggest fights in boxing history, was called “The Showdown,” an appellation which made sense given that each held one of the two official world title belts in the welterweight division. The rematch, held eight long years later, was billed as “The War,” but no one really knew why. Boxing was going through a transition period. Its biggest star was young heavyweight champion Mike Tyson, but after demolishing Larry Holmes and Michael Spinks, “Kid Dynamite” had no compelling opponents to challenge him, while elite talents such as Pernell Whitaker, Evander Holyfield and Meldrick Taylor had yet to become major attractions. 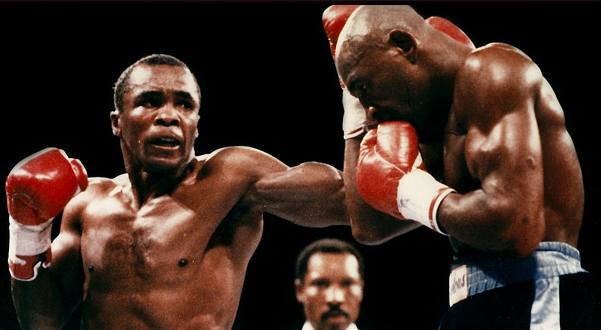 But Sugar Ray Leonard remained both one of boxing’s biggest stars and a mainstream sports celebrity. The aftershocks of his astonishing and controversial win over Marvelous Marvin Hagler two years before were still being felt and guaranteed him major attention and big money, no matter who he fought. 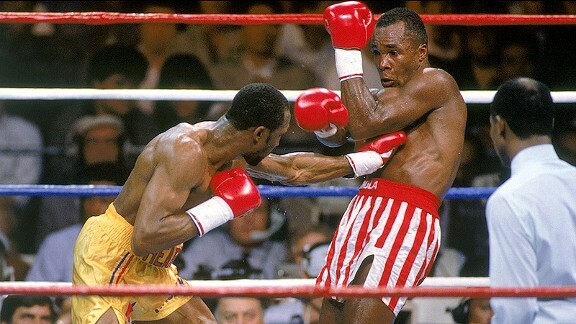 For a time it appeared Leonard’s upset win over Hagler would he his last. Though for a time it appeared the Hagler triumph would be the conclusion to Ray’s amazing career. He had given up his world titles and refused to make any public commitments regarding future fights, until, after an 18 month layoff, he unexpectedly returned to face unlikely opponent Donny Lalonde at a catch-weight of 168 pounds. 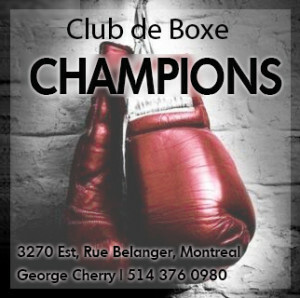 In a wild shoot-out he captured two more world championships, the newly minted super middleweight crown and Lalonde’s share of the light heavyweight title. The little-known Lalonde had been regarded as no threat to Sugar Ray, but he more than held his own, even scoring a knockdown, before succumbing to Leonard’s furious attack in round nine. Lalonde vs Leonard was a fight no one saw coming. And so close observers of Ray Leonard were not surprised when Leonard vs Hearns II was announced the following January. It fit the pattern that more and more boxing fans were discerning and starting to resent: the opportunism of the latter-day Sugar Ray. In fact, one could trace the tendency’s origins back to 1980 when Leonard insisted on an immediate rematch with Roberto Duran after his upset defeat to the Panamanian. 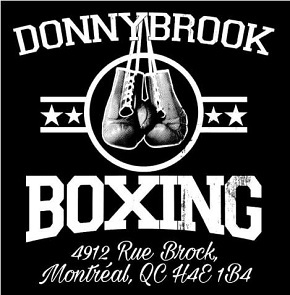 The opposition to a return taking place just five months after “The Brawl in Montreal” had been significant, but Ray insisted, even parting with trainer Dave Jacobs over the decision. In retrospect, the logic was obvious: Leonard knew Duran was bound to be something less than sharp after partying like a madman following the biggest and richest win of his career. Sugar Ray Leonard. Ink drawing by Damien Burton. But even after a record gate and a highly competitive struggle in the first Leonard vs Hearns clash, Ray refused to grant Tommy the same kind of favor, later insisting that Hearns would not get a second chance as punishment for his public statements regarding the referee’s stoppage of “The Showdown.” Then there was the timing of the Hagler fight, as Ray had insisted for years that the match would never happen. 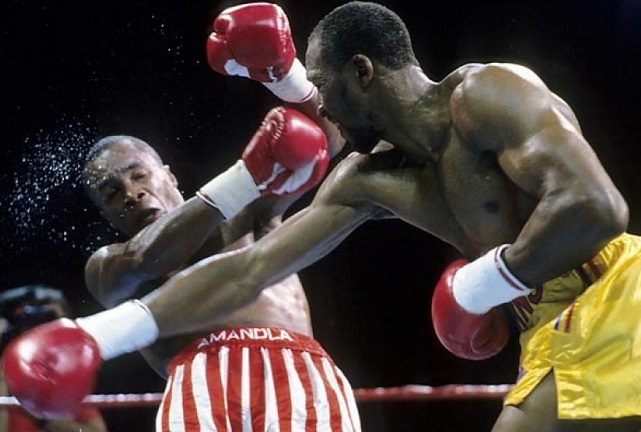 Only after Marvin displayed clear signs of being an aging and less dangerous adversary did Leonard agree to face him, and even then the fight could only go ahead after Hagler agreed to a 12 round distance, a larger ring, and bigger gloves. The Hit Man. Painting by Damien Burton. But now, for the first time, Leonard could not escape the criticisms and the anger of die-hard fight fans who couldn’t stop thinking about all the great fights Ray’s maneuverings had made impossible. The obvious question hanging over Leonard vs Hearns II was, “Why now?” Why had Leonard made everyone wait over eight years for a rematch that everyone would have loved to see back in 1982? The conclusion drawn by more than a few jaded boxing fans was that Sugar Ray was cherry-picking an over-the-hill Tommy after he had looked vulnerable against Kinchen, just as Ray had challenged Marvelous Marvin only after he had appeared susceptible in his grueling war with John Mugabi. 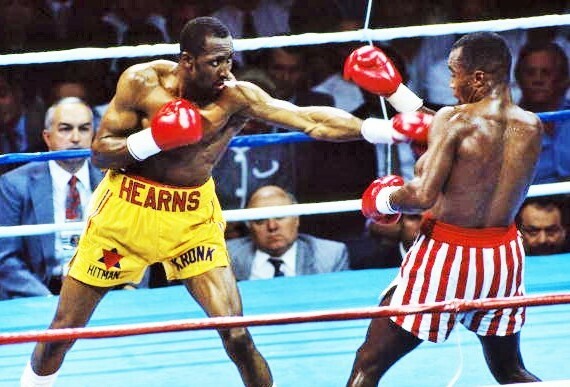 Hearns looked like a shot fighter against Kinchen in November of 1988. But even if that was the case, Thomas “The Hit Man” Hearns didn’t care. Ray and the public could think whatever they liked; Hearns knew this was a fight that could define his career, or re-define it. Make no mistake, that first defeat to Leonard had been devastating. Thousands of Tommy’s fans from Detroit had cheered him on, many placing huge bets that he would knock out Sugar Ray. 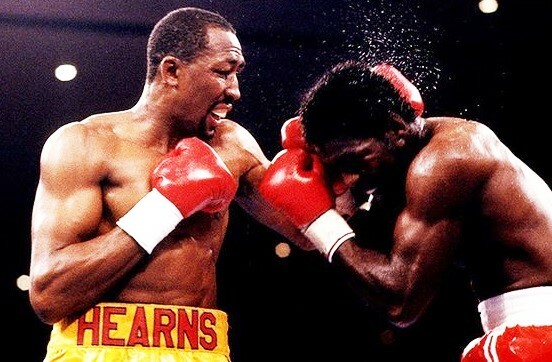 In the 12th round of that fabled fight, Hearns was in control and ahead on points, poised to notch a massive victory and prove himself the best boxer in the world. But then came Angelo Dundee’s famous “You’re blowing it!” speech and Leonard’s blistering two-fisted assault before the contest was stopped in round 14. Many took for granted that a rematch would soon follow. Instead, Ray defended his world title just once more before announcing his first retirement, due to a detached retina. The end of their first great battle. Why so long for a rematch? Tommy’s standing and reputation didn’t fully recover from the Leonard setback until June of 1984, when he scored a stunning second round knockout over Roberto Duran. 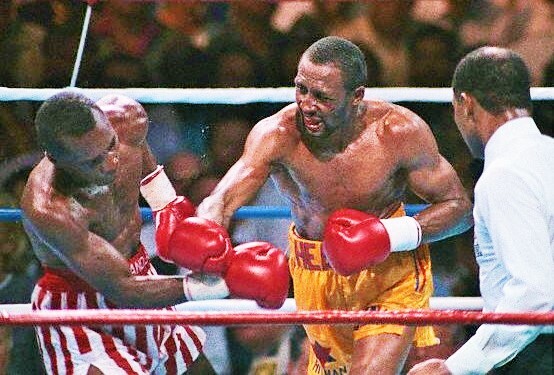 A subsequent win over Hagler would have all but erased the defeat to Sugar Ray, but it was not to be; Marvelous Marvin stopped him after the famous “Eight Minutes Of Fury.” A year later the stage was set for Hagler vs Hearns II when Ray unexpectedly emerged from retirement to challenge Marvin. Thanks to Leonard, Hearns was deprived of a huge payday and a chance for redemption. 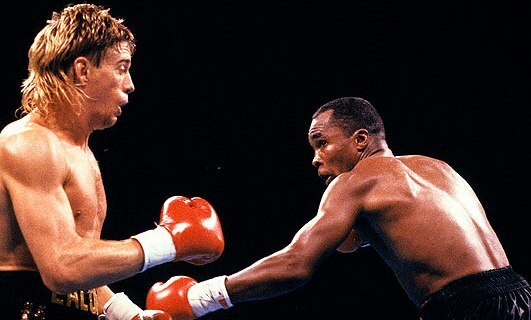 While becoming the first boxer in history to win four divisional world titles in October of 1987 was a genuine triumph, it couldn’t substitute for what Tommy wanted most: Ray or Marvin in the ring again. But now, finally, after waiting eight long years, Hearns finally had his chance. And if Leonard thought “The Motor City Cobra” had lost his bite and was there for the taking, Tommy knew otherwise. 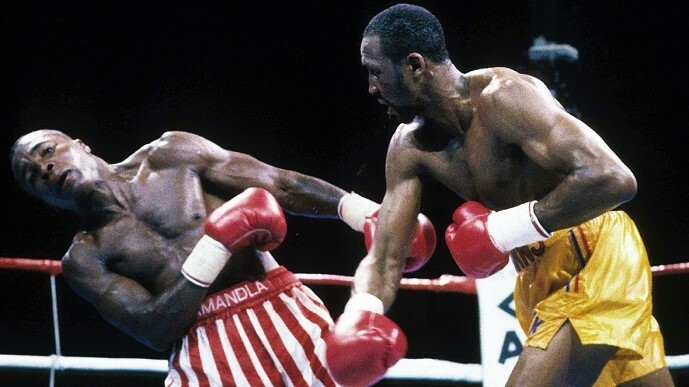 Leonard vs Hearns II wasn’t about Sugar Ray adding to his legacy by blasting a shot fighter out of the ring; it was about Hearns getting the revenge for which he had waited so long. And indeed, the fervency of his hunger for vengeance was made clear to all when a personal and family tragedy occurred that many, if not most, might have expected to scuttle the fight. Just 48 hours before both men were to be in the ring at Caesars Palace, a 19-year-old woman was shot and murdered in Thomas Hearns’ Detroit home; police charged the fighter’s younger brother, Henry, with the crime. No one would have held it against Hearns if he had returned to Detroit to deal with the tragic situation but he did nothing of the kind. According to Bob Arum, Tommy “never even considered” pulling out of the fight. As in the first fight, Tommy’s jab gave Ray trouble in the early rounds. At stake was Leonard’s WBC super middleweight title, which normally would have meant a weight limit of 168, but both camps had agreed to a catch-weight of 164; Leonard came in at 160 while Tommy was just over 162. If many thought the match an anti-climactic affair, a clash that should have happened years before and that had now lost its luster, by fight time the atmosphere at Caesars Palace was truly electric. 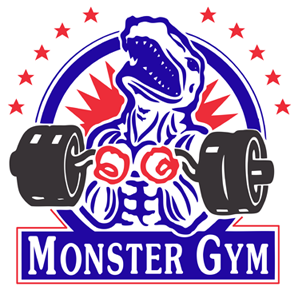 Indeed, it had become the hottest ticket in the country, a fact borne out by huge closed circuit and pay-per-view numbers, as well as the fighters’ purses, with Ray and Tommy receiving guarantees of $13 and $11 million respectively, plus percentages. And to everyone’s relief, the fight itself redeemed the attention and big money as Hearns showed he was far from the washed-up fighter that many, including Ray, thought he was. 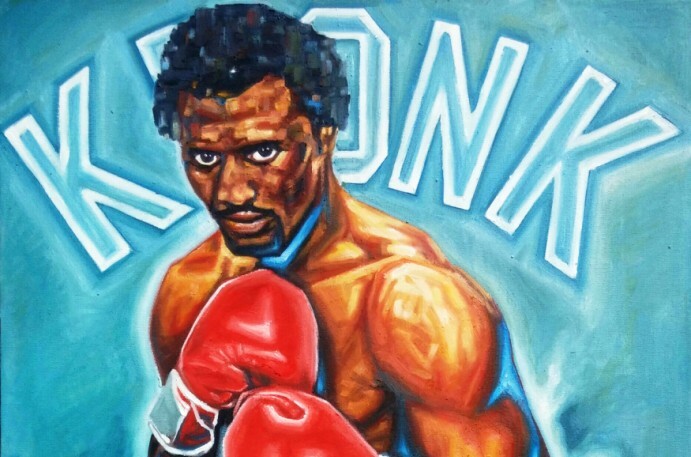 The vulnerable boxer who had lost to Iran Barkley, and who was almost knocked out by Kinchen, was replaced by a determined warrior on a mission who continually stalked and threatened Leonard. Once again Hearns gave Sugar Ray all kinds of difficulties with his aggressiveness, long reach, quick hands and deadly power. Hearns clearly had the edge in the early going while Leonard appeared to have difficulty finding a groove. And in round three all preconceptions about Hearns being a shot fighter went out the window when Ray threw a lazy left to the body to set up a right and Tommy beat him to the punch with his own right. The blow staggered Leonard and Hearns pursued, forcing Ray to the canvas with a second right that was a glancing blow; had it landed flush the fight might have ended then and there. A visibly shaken Ray was up at the count of five but a stalking Hearns failed to get his punches off and by the end of the round Leonard had fully recovered. Later he would link his sluggish start with the tragedy back in Detroit. The sixth was a jabbing contest as a winded Leonard needed time to recover his energy and Hearns worked to avoid getting tagged again. At its end Steward scolded his fighter, exhorting him to “let your shots go!” and Tommy responded, stunning Ray with left hooks at the start of the seventh and chasing him along the ropes, a right hand buckling Leonard’s legs. But Sugar Ray came back and landed some heavy artillery to the body to finish the round strongly. Round eight was uneventful until with a minute left Hearns opened up with some jabs and right hands, the fighters exchanging blows after the bell. The pace picked up in round nine but Leonard was making the serious mistake of looking for a knockout punch to decide the outcome instead of staying busy. Tommy got some snap back in his jab and started working a heavy left to the body which set up a good right hand near the end of the round, before Leonard staggered Hearns with a left hook. Steward again urged his fighter to go for the knockout but it was Ray who was looking for it at the start of the tenth. The drama of the match had boiled down to who would strike first with the big shot as both men knew they could hurt the other. 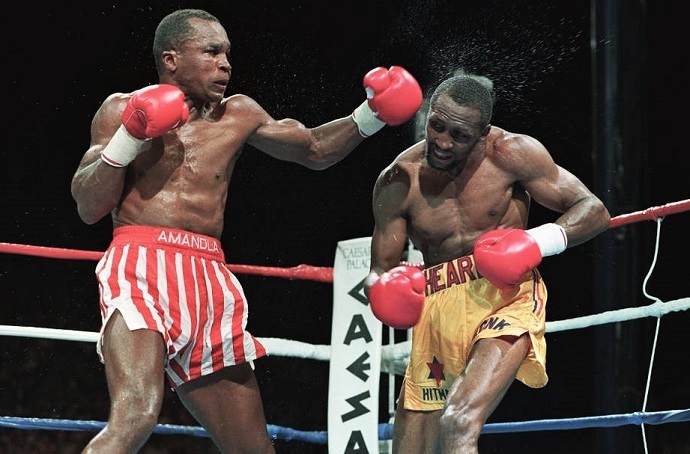 And in round 11 Hearns, who appeared to most observers to be clearly ahead on points, did indeed strike again with his battering ram right, three of them getting home and sending Leonard to the canvas for a second time. Up at the count of five, Ray appeared exhausted but he gave as good as he got for the rest of the round as the fighters took turns landing heavy blows. 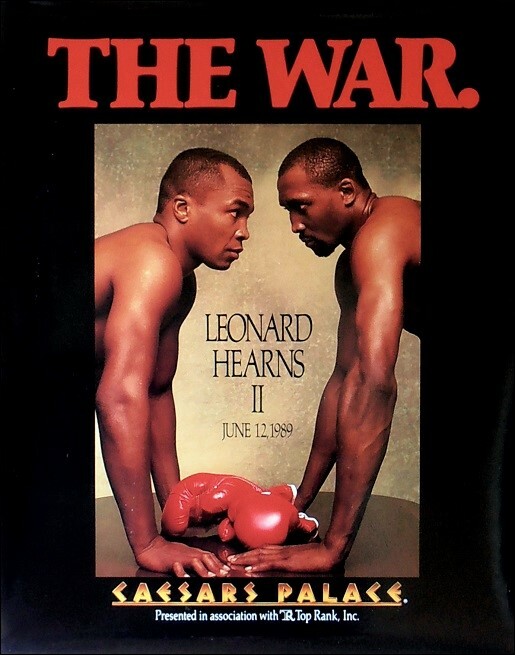 Now it seemed certain that Leonard needed a knockout to win, but Hearns, ever the intense competitor, did not coast in the final stanza, and instead looked to end the battle the right way, the way a warrior should, letting his hands go and battling with fury to the end. But if fight fans were grateful for Hearns being so game and willing, his bravery almost gave Ray a dramatic final round knockout win, as a badly hurt Tommy hung on for dear life in the last minute. 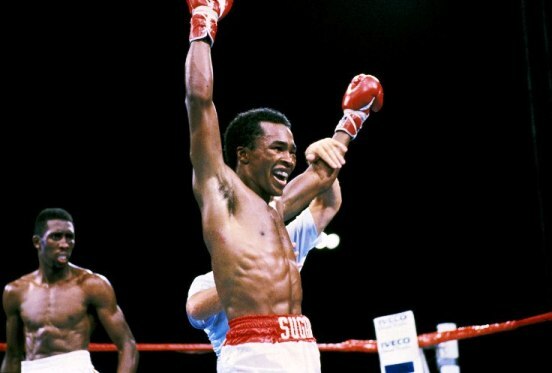 A desperate Sugar Ray even nailed Hearns on the break, but he could not put Tommy down and at the final bell it appeared to most, if not all, that “The Hit Man” had indeed seized redemption.